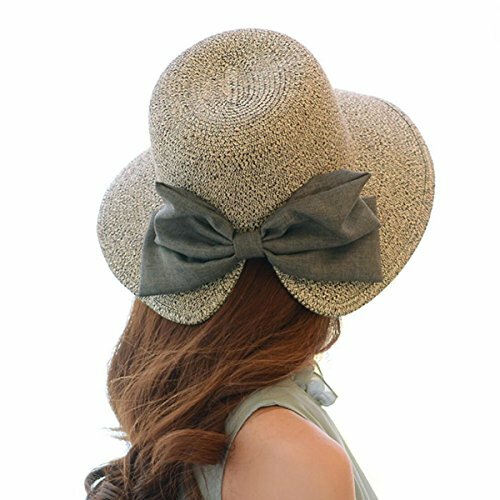 panama/floppy style hat has a medium-wide brim, adjustable string for size, and a cinched black ribbon for an extra accent. rays, all while looking fab and stylish as you chillax on the sandy beach, pool, private lake, backyard and all outdoor events! Centennials, Millennials, Generation X and Baby Boomers will all love this ageless sunhat! It is very important for girls/ladies/women to protect themselves from directly strong sunshine. The sunshine ultraviolet ray will do harm to your skin,makes dark spots,accelerate aging,even cause skin cancer. It is necessary to use a sun protective hat when you are outside in the summer. This sun hat has UPF 50+ sun protection,can protect you from ultraviolet ray. 1. Material:Paper Straw;The hat is made of thick,soft and comfortable paper straw,keep you cool and comfy. 2. Sun Protective:Rated UPF 50+ Maximum Sun Protection,keep you away from directly ultraviolet ray. 3. Large Brim:The hat can keep your face and shoulders in the shade. 4. Size: Circumference:56-58cm/22"-22.8",breathable sweatband with an internal adjustable drawstring ties allows a variety of head shapes and sizes,can always keep you dry and comfortable while wearing . 5. Foldable: It is easy to pack up to put in your bag when you don't need it in shade . Good-Looking:Solid color with ribbon bowknot,simple and stylish;Perfect for girls,ladies,women to wear and match for any attire,match anything from maxi dress to hot shorts,from jeans to beachwear/swimsuits;Absolutely a must have accessary in your wardrobe. High quality paper straw,lighweight and breathable,thick but soft for a luxurious customized feeling;Floppy and foldable large brim is good for keep you in shade and easy to pack up;If you fold it for long time and make a little fold mark, you can blanch it with hot water and then dry it, or use iron and hair dryer make it returns to its original shape easily!! Occasion: Super cute verbiage embroidery fun hats,Perfect for beach vacation and cruise,also great for summer rides,fishing and hiking,beach,park or pool,camping,gardening,walking your dogs,vacation,honeymoon ,sun protection against harmful sun rays including premature wrinkles and sunburn. If you have any questions about this product by YSHARE, contact us by completing and submitting the form below. If you are looking for a specif part number, please include it with your message.